Gordon Hudson (PAUL WINFIELD) returns to Harlem, after completing service in Vietnam as a Green Beret captain, to attend the funeral of his wife who died from an overdose of heroin. He learns the name of the pusher who turned his wife on, a huge man named Big Pink (NATHAN C. HEARD), and, using his expertise in karate, kung-fu and street fighting, he severely beats up and hospitalizes the giant. 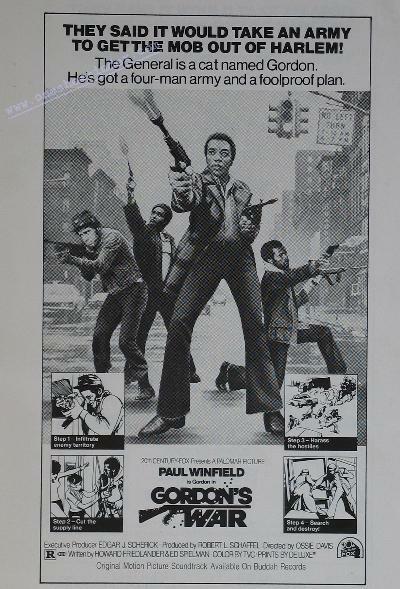 Harlem drug kingpin Spanish Harry (GILBERT LEWIS) retaliates by sending out three brass-knuckled and armed hoods to beat up Hudson. A man now with a mission, Hudson recruits three former Green Beret buddies, the studious Leroy "Bee" Bishop (CARL LEE), the militant Otis Russell (DAVID DOWNING) and the big dude, Roy Green (TONY KING) to team up with him to battle the pushers, pimps and the mastermind behind the drug traffic in Harlem. prostitutes to "clean up" and, at gunpoint, rob a heroin cutting room of thousands of dollars worth of heroin. They also blow up the cars of Harlem's leading drug dealers when they meet with Spanish Harry to discuss the threat Hudson and his buddies pose. Meantime, Hudson is trying to smoke out the White Mr. Big of the city's narcotics business who sits in a tower office building on Park Avenue and relays orders to his Wall Street-type "board of directors." Mr. Big puts a contract out on all three after they rob a safe containing ten pounds of heroin by entering the building through a skylight, first throwing a captured hit man through it to attract the guard dogs. They then subdue the guard and steal the whole safe by letting it fall out a window into a garbage truck below and drive off with the loot. Otis, Bee and Roy are led into ambushes. Otis and Bee hit their hit man (ADAME WADE) first but Roy is lured by a beautiful white girl (JACQUELINE PAGE) into a trap set up by Spanish Harry. He and the girl are slain. Hudson, too, is trapped by a killer whom he attacks with a cigarette lighter and a spray deodorant can. Later, when he gets to his car, he sees a package which contains Roy's alligator shoes and Spanish Harry's phone number. He phones the drug kingpin who offers to release Roy for the heroin Hudson now has. Hudson agrees to a meeting at a deserted warehouse. Hudson, Otis and Bee are prepared for a trap. Spanish Harry tells Hudson of Roy's demise after the former hands him the heroin. The drug kingpin's hoods whip out guns, but Hudson is more than ready because inside the shopping bag in which he carried the heroin, he has a deadly double-barreled Magnum shotgun which he whips out and sprays the hoods with. A shoot-out results and Spanish Harry's car explodes. He commandeers a motorcycle and Hudson gives chase in his car. Weaving in and out of traffic, the car sideswipes, skids and tries to catch the motorcycle which goes into a wrong lane and, finally goes right through a store window killing the mobster. Mr. Big knows when he is beat. He agrees to meet Hudson on the dark street outside the command post. His Mercedes Benz limousine draws up and Hudson gets in. Then two black cars, filled with Mr. Big's hoods converge on the limo. They find only the bodies of an elegant man in the back seat and the chauffeur up front. A sanitation truck drives down and away from the street. Director of Photography .......................... Victor J. Kemper, A.S.C. Produced by Palomar Productions, Inc.
Sound Effects Editing .......................... Film Sound Inc.